It happens every year. As the days of March get checked off the calendar, a special kind of anticipation starts growing. March Madness is just around the corner and so is all the excitement and team spirit that comes with it. Each year, collegiate sports fan gear up and get ready to fill out their brackets with the 68 teams that will compete in one of the most important collegiate tournaments of the year. From the day of selection until the championship game, March Madness is one of the best times of the year for sports fans across the nation. No matter how you look at it, there’s something special about March Madness. Let’s take a closer look at this beloved American tradition and how you can make this year’s celebrations the best yet. March Madness is a tradition that’s unique to the United States. Nowhere else in the world will you find such a tremendous build up over collegiate sports. An onlooker might say that we have an obsession with college basketball. We’re not inclined to disagree – in fact, we think our “obsession” is a great thing. The flurry of energy that surrounds March Madness isn’t anything new. March Madness was actually born in the early 1900s, except the focus was on high school basketball rather than collegiate teams. Still, so much anticipation built up around the tournament each year that it didn’t take long for the “Madness” to catch on. Eventually the term “March Madness” spread to collegiate basketball tournaments as well but the early days of basketball fever looked nothing like it does today. During the first NCAA men’s basketball tournament in 1939, only 8 teams competed – a number that pales in comparison to the 68 spaces that make up round one of today’s brackets. In being completely honest, it isn’t just basketball that defines March Madness. A major part of the tradition is wrapped up in how we celebrate it. A basketball game during March Madness isn’t one of those occasions where you casually sit at home and catch the game. No, there’s a certain way to celebrate March Madness. Of course, a big part of the tradition is filling out your bracket and maybe even making a few bets among friends. Someone always ends up buying the table a round after their bracket pick gets knocked out of the competition. At the heart of every memorable March Madness celebration are good times spent with great friends. Where these celebrations happen is important. Of course, you’d be hard pressed to find an empty sports bar during a tournament game, but is that really the scene that you’re after? You could stay home and throw a March Madness party of your own, except that’s a ton of hassle and you don’t have multiple screens to catch every game making shot. You’re past the time in your life when standing in line at a crowded bar with sticky floors is your idea of a good time. You’re looking for an experience that’s more sophisticated but doesn’t leave you feeling short changed in terms of high energy and atmosphere. You want amazing food, great drinks and a place to enjoy the tournament games in style. With all the different March Madness restaurant traditions, why choose Hearthstone Kitchen & Cellar to celebrate with your friends? Well, we could start by talking about the mouth watering menu or creative genius of the mixologists, but all that can wait a minute. 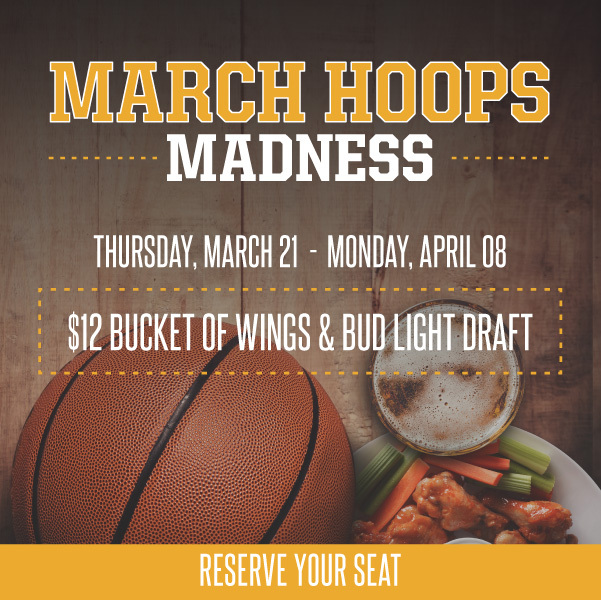 Hearthstone Kitchen & Cellar has prepared for your March Madness celebration by offering tournament inspired specials – like a bucket of their legendary buffalo style wings paired with the American classic Bud Light draft for $12. If you’re looking for a bit larger of a spread to nosh on as the tension builds up during the game, Hearthstone Kitchen & Cellar has a menu that will cater to all your cravings. You can stick to game day classics like pigs in a blanket and pepperoni pizza, or you can take it up a notch with jalapeno curry hummus, crispy calamari or the chef’s meat and cheese board. Let’s not pretend that March Madness celebrations are all about the food. Everyone knows that the beer, cocktails and other spirits are an important part of the game day activities. Hearthstone Kitchen & Cellar offers a practically endless list of wines and beers, featuring something for everyone. If you’re interested in something a little stronger to help you deal with your team being knocked out of the bracket, there’s also an impressive list of bourbons, whiskey and scotch to choose from. Hearthstone Kitchen & Cellar is like no other downtown Summerlin restaurant. With a gorgeous open floor plan and an interior that perfectly combines warm, woodsy elements with industrial touches, you’ll find that it’s easy to make yourself at home. You’ll also find a menu that’s tailored to the discriminating tastes of the Las Vegas restaurant scene. Trust that once you enter Hearthstone Kitchen & Cellar, that you’ll never leave feeling disappointed. March Madness is here – how are you going to celebrate? This year, skip the crowded sports bar scene and begin a new tradition by celebrating in a classy, stylish bar that’s infused with the energy of the college basketball season. 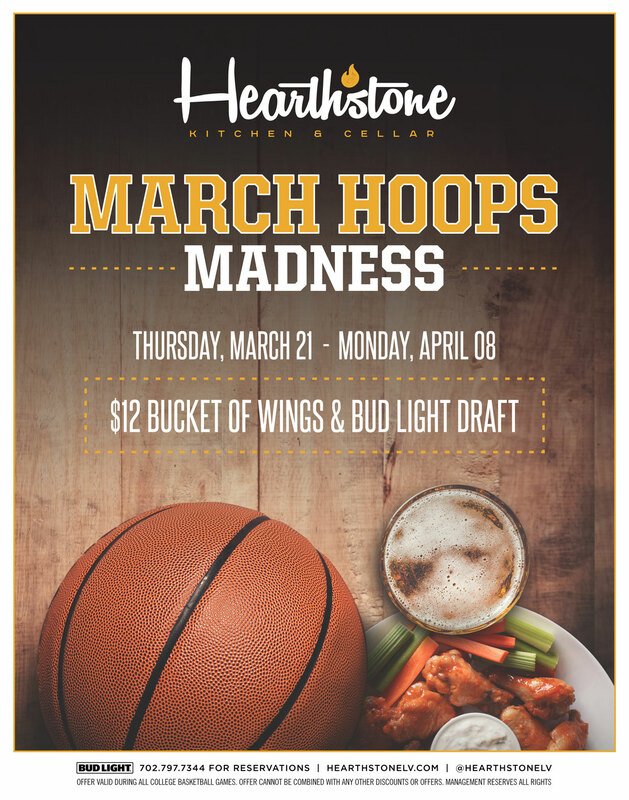 Check out Hearthstone Kitchen & Cellar for their March Madness restaurant promotion and make your reservations today.